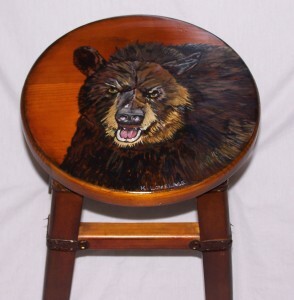 A Black Bear looks ferocious on this short wooden stool. The stool stands approximately 15.5 inches high, and the legs have leather trim. The painted surface is protected with ten coats of polycrylic, so the stool is completely functional. You can use it without fear of damaging the underlying painting. Click here to return to Animal Paintings page. This entry was posted in Animal Paintings, Stools. Bookmark the permalink.